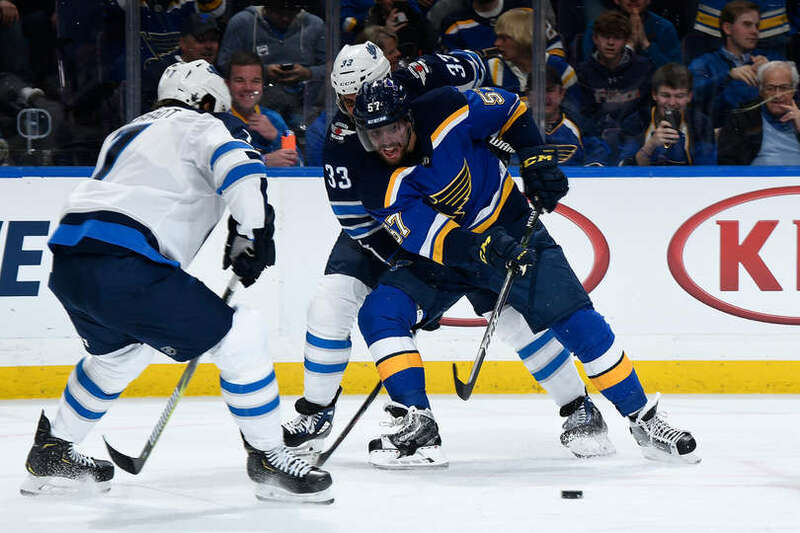 ST. LOUIS — The ability to bounce back gives the Blues confidence they will do just that for Game 4 of the Western Conference first round series against the Winnipeg Jets. The Blues, who lead the best-of-7 series 2-1 after being thumped 6-3 in Game 3 on Sunday night, were back at Enterprise Center on Sunday looking at video, and some guys went on the ice for an optional skate, interim coach Craig Berube declared it in simple terms how the Blues will approach Game 4 (8:30 p.m.; FS-MW, KYKY 98.1-FM, KMOX 1120-AM after Cardinals-Brewers). "We're going to get a good game tomorrow," Berube said succinctly. And that wouldn't be a surprise, since the Blues, who finished the regular season 30-10-5, had multiple losing streaks only three times. They were 0-1-1 in one, 0-2-0 on another and 0-2-1 in the longest one, which was three games. But the ability to park losses has been common, and tomorrow should be no exception. 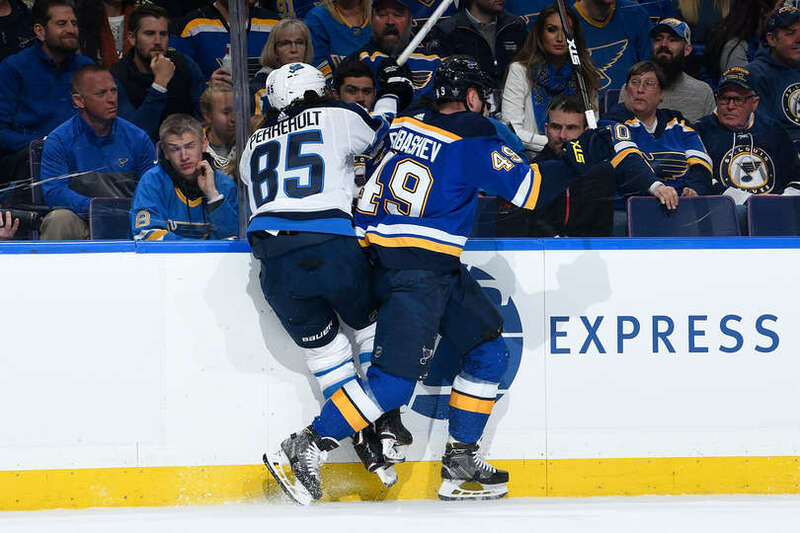 "Yeah, playoffs is one of those times where you’ve just got to make sure you’re even-keeled," Blues defenseman Colton Parayko said. "If you look at the series, we’re still up one (game), which is nice. We expect another hard game from them tomorrow, same as last game from them, if not harder. Obviously they want to go home tied and we want to go up two going there. So it’s going to be a battle tomorrow, it’s going to be fun. It’s playoff hockey." Another reason for optimism: Jordan Binnington. The Blues rookie goalie is 6-0-0 with a 1.79 goals-against average and .935 save percentage following a loss. "It's a loss and the series is 2-1," Binnington said. "If we win that game, we're preparing the same for Game 4. Hopefully we get some rest and get prepared for Game 4. "They came out hard and I think we weathered the storm a bit in the first period, but they kept coming. Sometimes it's not going to go your way. It's how you handle things in life and in the game of hockey. I'm just going to prepare for the next game." What the Jets did in Game 3 was forecheck the Blues into turnovers, mistakes and got the Blues running around in their zone with loose coverage and chasing the puck. All were bad combinations after escaping the first period with a 1-0 lead thanks to David Perron's power-play goal. "I thought pace. They had more pace than us right away in the game," Berube said of the Jets. "More urgency. We didn't match that early on. We escaped the first period 1-0 but even in the second, they were desperate and we've got to match that desperation." And more importantly, play more north-south. The Blues got into those habits of playing east-west and that's where the turnover troubles started, and when they did, that fueled the Jets' transition game. "I think our desperation has to be a lot better," Blues forward Jaden Schwartz said. "We all know it wasn't our game. I thought we weren't aggressive, we were on our heels a little bit, I thought our puck support wasn't good either. We'll watch some film and make some adjustments, see what we can do better and I think the biggest thing was zone time. We didn't really create any zone time and that's where we're at our best." The Jets spent much of the first period in the Blues' zone and that's where they got caught running around chasing the puck instead of dictating play, chipping, chasing and checking themselves in the offensive zone. "We didn't get to our game last night," Berube said. "We didn't play a north game, and get the puck in deep. And forecheck. And create O-zone time. That's our game. We didn't get to our game. The first two games, I thought we did a good job of that and it resulted in some goals." A Blues win on Tuesday puts them in the cusp of closing the series out, with Game 5 set for Winnipeg on Thursday (time TBA). A loss, it turns into a best-of-3 series and the Blues will at least have to win one more game in Manitoba. "Just come prepared when the puck drops," Parayko said. "Obviously the game times are different in the playoffs - 8:30 games, 6:30 games, 7 o’clock games. But just make sure that you’re ready for puck-drop, and whatever that may be, whatever you’ve got to do, just be ready." "There's no panic in here," Perron said. "We've just got to look at some video, talk about things tomorrow. We'll be fine. It's one game. Whether you win 7-0 or you lose 1-0, it's worth one right now. Got to give them credit, they played a good game." "No, no panic in this room," Blues defenseman Alex Pietrangelo said after the game. "We’re up 2-1 for a reason. Again, we’ll look hard in the mirror. We know that that wasn’t us [Sunday]. So take tomorrow and get ready for Tuesday."